Podbean integrates with the MailChimp email service so you can automatically deliver your podcast to your mailing list. To get started, simply get the MailChimp app in the Podbean app marketplace (free for all unlimited accounts). Click on the “settings” icon next to the app in your dashboard to configure your email. We’ve set up a template, which you can use as is or customize. You’ll need to choose the email list you want these delivered to if you have multiple lists. 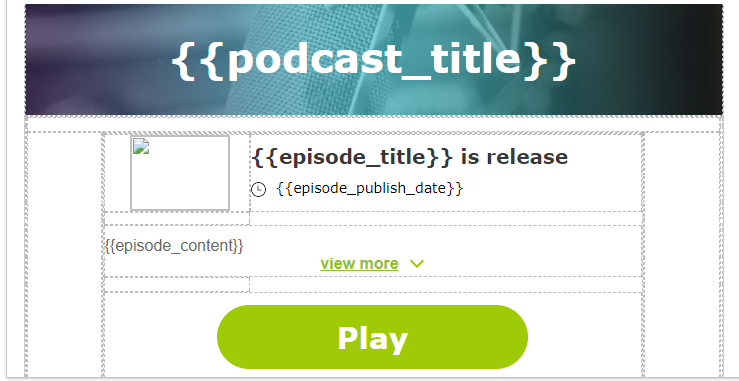 The information in brackets will automatically populate the email from those fields for your podcast/episode. Then, when you publish a new episode, the email will automatically go out to your chosen MailChimp list. You can turn this feature off by toggling off “New episode notification email” at the top of the settings. Connecting Mailchimp with Podbean also allows you to import premium subscribers/private members (if applicable) to your Mailchimp lists. It’s easy and free to set up a MailChimp account if you don’t have one yet. You can also add a MailChimp subscribe form to your Podbean site, to help build your email list.